Lalbaugcha Raja (King of Lalbaug) is the most famous Ganpati idol in Mumbai. It is believed that this Ganesh Idol is Navsacha Ganpati (which means the fulfiller of the wishes). Lalbaugcha Raja Sarvajanik Ganeshotsav Mandal was established in 1934. Lakhs of Ganesh devotees come here to seek blessings of Lord Ganesha during ten days of Ganeshotsav. There are two main lines to see the idol: a general line, and a navas line for those wanting to make a vow or get a wish fulfilled. Lots of celebrities from Bollywood, sportsmen, politicians, and other visit Lalbaugcha Raja to seek his blessings. The Ganesh idol of Kings Circle’s GSB Seva Mandal is very popular amongst devotees during the Ganesh Chaturthi. 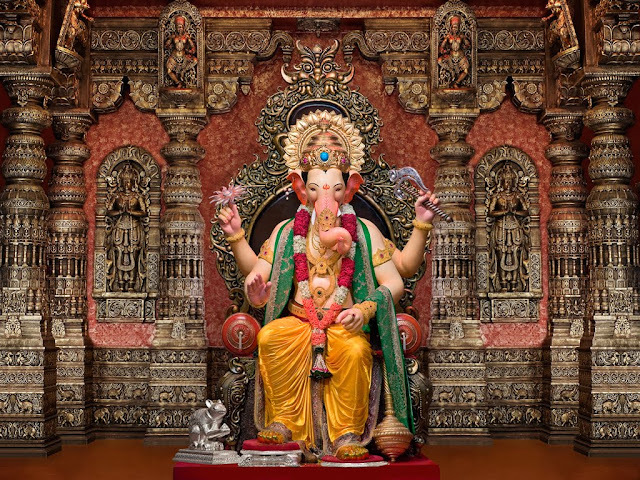 This Ganesh idol is popularly known as Golden Ganpati of Mumbai as it is adorned with gold and silver jewellary worth 100 millions of rupees. This Ganesh mandal was established in 1954 by a Gowd Saraswat Brahmin. he Ganesh Idol of this mandal is always a eco-friendly idol made of clay and another unique thing of this Ganesh Mandal is that instead of playing recorded film music or devotional songs, this mandal celebrates the Ganesh Chaturthi is a religious manner, playing traditional Indian musical instruments used in south Indian temples is played. Founded in 1928, Ganeshgalli is famous for its 22 ft. tall idol of Lord Ganesha, one of the tallest idol of Lord Ganesha in Mumbai. Ganesh Galli Ganesh idol is equally famous as the Lalbaugcha Raja as is located in Lalgaug, Parel, just adjacent to Lalbaugcha Raja. The mandal is also famous for its impressive decorations. Sarvajanik Shree Ganeshotsav Mandal was established in 1970 at the Khambata Lane at Khetwadi in Girgaon area of central Mumbai. The Ganesh idol of this mandal is known as “Khetwadi Cha Raja”. Every year Hindus, Muslims, Parsis and Christians come together to celebrate this ten day Ganeshotsav festival. The lighting and decoration is what made this galli so famous. Nikadvari Lane Sarvajanik Ganesh Mandal’s Ganesh Idol is a another popular Ganesh Idol in Mumbai during the Ganesh Chaturthi festival. The mandal is famous for its 25-feet long eco-friendly Ganpati idol. This ganesh idol is popularly known as Girgaoncha Raja. Sahyadri Krida Mandal located in Chembur’s Tilak Nagar is also a famous Ganesh Mandal in Mumbai during Ganesh Chaturthi. This Ganesh Mandal has always been in news for two reasons, its elaborate pandals and its huge funding by underworld don Chhota Rajan — though the organizers deny this. However in last few years, the organizers have toned down the lavish sets. Still a place to visit during Ganeshotsav.